I love listening to music in the morning and really, throughout the day. But, unfortunately, depending on when everyone makes it out of bed, popping that CD into the CD player or, if you are a “streamer,” queueing up that song/playlist just doesn’t happen. I wish we listened to music more frequently during the week because it’s mood altering effects are awesome. Everyone seems to stay focused and the milk goes back into the refrigerator instead of the cupboard with the drinking glasses. There are songs that I’ve turned to in the past that certainly help, but what has recently brightened the mood are chants. I know, that word “chants” seems strange, but read on! Lisa Loeb – remember her? She’s the master of that awesome 90’s hit “Stay” which was featured in the movie Reality Bites? In the last few years, Loeb has released several children’s album’s that are focused on camp-themed songs. You can read more about her Camp Lisa album and the Camp Lisa Foundation here. 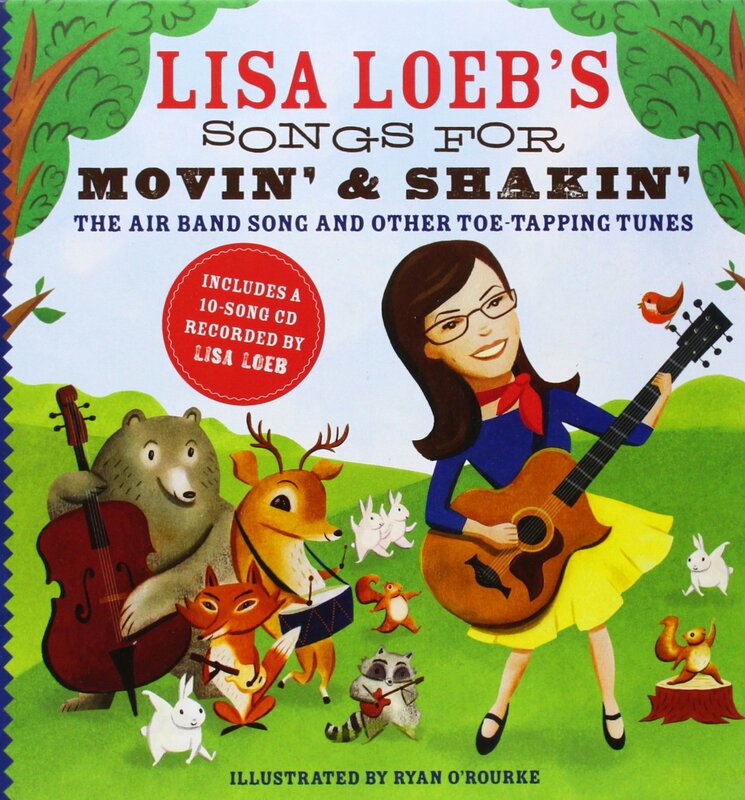 Last year, Loeb released a song/book combo called Lisa Loeb’s Songs for Movin’ and Shakin’: The Air Band Song and Other Toe-Tapping Tunes.” Aside from the fact that there is a song about being a total rockstar in your own air band, there are a couple of songs that have been perfect for getting through the morning. One of them in particular, “Everybody Wake Up,” is an updated version of “The Wakeup Song” from the Camp Lisa album. It’s a great song you can clap and stomp along with. Heck, you can even substitute your own lyrics and instead of stomping have everyone march to the breakfast table. The actual book that the CD is packaged with provides additional fun if you are home with a little one or need some activities for everyone after the school day. The 24-paged book promises to “get you up out of your chair!” To inspire her audience, Loeb included lyrics and dance instructions, i.e. clapping for “Miss Mary Mack,” how to scare away a monster in “Monster Stomp,” how to tell your left from your right (because your LEFT hand is the only one that can make an “L” shape with your thumb and pointer finger), and even some helpful reminders like hitting the hay earlier for an easier rise and shine. And for those that like a morning stretch or two, “Hello Today” offers some yoga-inspired poses. Ryan O’Rourke adds to the book’s charm with colorful, retro-style illustrations. I definitely recommend checking this book/CD combo out! Do you enjoy the morning rush? Have you gotten a tardy card before? I’d love to hear your thoughts so please share any tips that help you remain sane and calm whether it involves music, chanting or something else. ps – the other songs I referred to that relate to this topic are “Busy” by The Not-Its! and “Gotta Get Up” by the Sugar Free Allstars. Videos below.